It's almost no secret that I love Open Source Bridge. 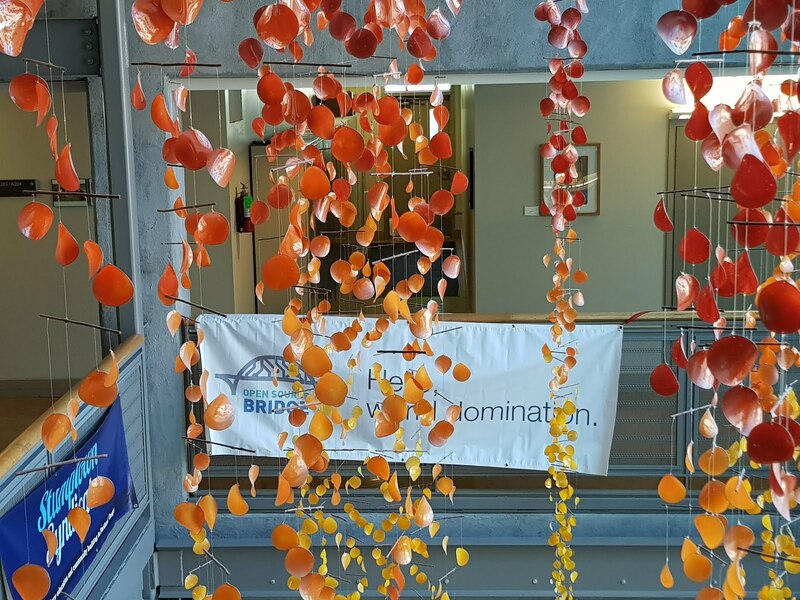 There are plenty of super awesome developer conferences out there. A lot of which I never visited. 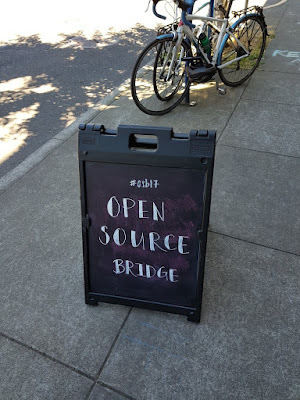 But even among the ones I was fortunate enough to visit, Open Source Bridge is very special. In 2016, I was invited to present a talk regarding some IoT work which at that time was still important to Mozilla. OSB stopped recording videos from that year, but this resulted in an opensource.com article which you can read here. This year I was invited to deliver a talk on WebVR and Aframe titled "Aframe: Your weapon in the war to democratize virtual reality". The talk was immediately after LinuxCon Beijing and the dates actually clashed. This time the conference was from 20th to 23rd June. 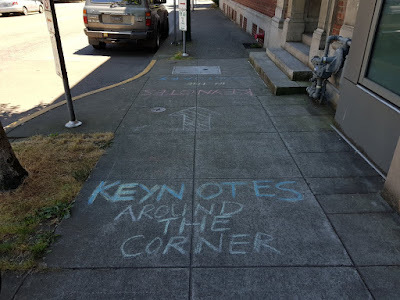 Where 23rd was unconference day. I only had 23rd left and they actually gave me a slot on 23rd! The unconference day. 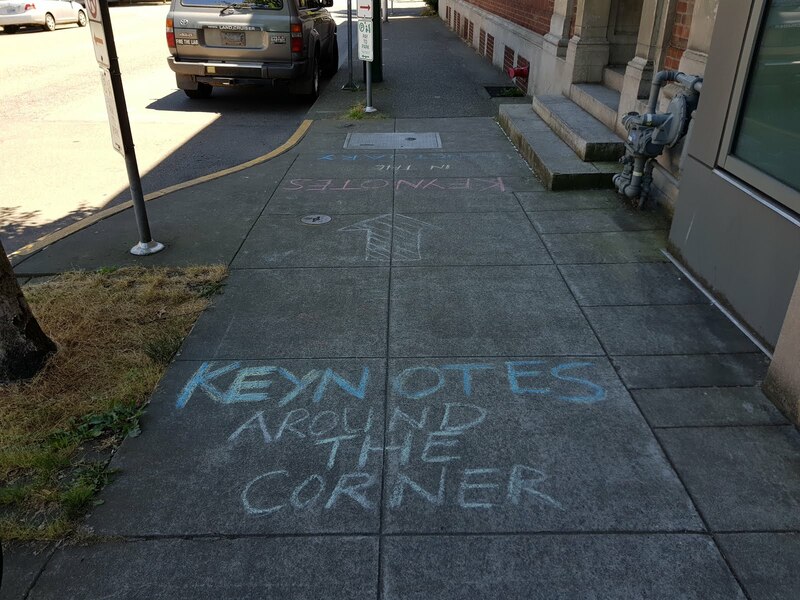 I reached Portland the night before and had my slides prepared. Fortunately, a flight back from Beijing is a pretty long one and gives you enough time to come and polish your slides. The next morning my talk was scheduled at 10 A.M. That was the only talk of the day apart from the impromptu unconference style events planned for the whole day. I reached the venue in the morning and was taken to the room where the talk was supposed to be held. Most attendees generally leave after the main talks and since this was an unconference day, I really was not expecting too many people. And when I started the talk, there were exactly 4 people in the room, as expected. I was not expecting too many people anyway. Thought it was fine, so started with them and then it all changed. Just when I was about to finish introducing me and what webVR is, a bunch of more people entered the room. I just did a recap and started and by the time I was explaining why it is important to have an open ecosystem for the Virtual Reality scene, the room had completely filled up with people standing at the back! That was a complete surprise for me and a huge confidence booster. The rest of the talk went pretty well and very interactive. During my Q&A the audience asked if they can have a longer Q&A and the organizers encouraged me to continue since they didn't have any fixed schedule. The 40 minutes talk ended with an equally bigger super engaging Q&A. But that was just the beginning of my surprise. Once it was finished and I was packing up, around 12 of the participants came and asked me if I will be available for a unconference type discussion regarding different privacy concerns of VR along with VR empathy and would like to discuss that. This ended up being another 30 minutes of passionate discussion about different aspects of VR and contributing to two pages of my notepad withed up wuth scribbles and ideas. It really was a pleasant surprise to me that on the last day of the conference how many people were still passionate about the topic that they filled up the whole room and also took initiative to have a discussion on the technology and social aspect. 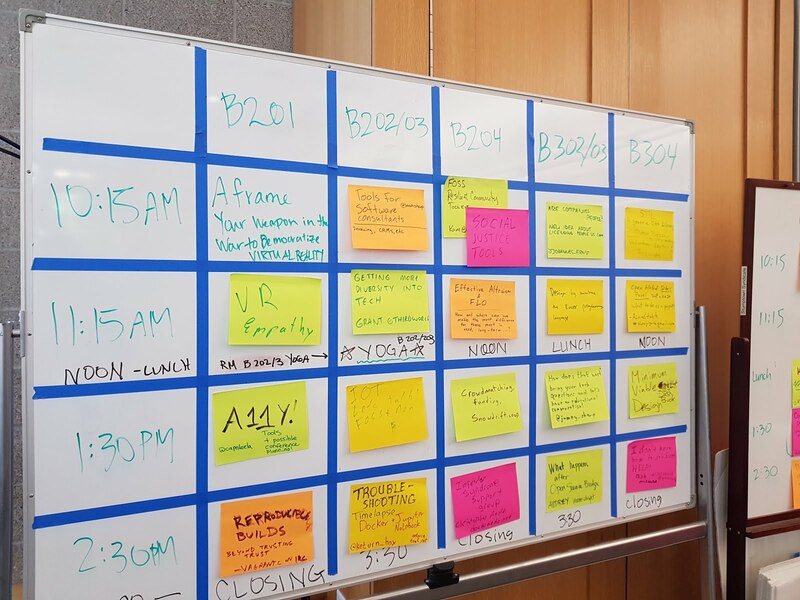 My only suggestion for the organizers was to have the conference on weekends instead of in the middle of a week. That would have made it much easier for me to juggle my schedule and I assume was similar to a lot of other attendees too. Though it really was just a one day experience for me, I really left the conference that day with a high note. Do drop a note if you were present at the talk, and have any suggestion for me to improve.